A week after the sealing of the Warsaw Ghetto, a Polish historian named Emanuel Ringelblum organized a secret group of more than sixty members. The group’s mission was to document life in the ghetto and tell the story of Polish Jewry. Comprising writers, poets, rabbis, activists, sociologists, economists, and others, the group met every Saturday for three years and called their collective the Oyneg Shabes. They collected and wrote material about their lives—testimonies, essays, poems, photographs, diaries, paintings, underground newspapers, and more. These materials were buried on the eve of the uprising in the Warsaw Ghetto in metal boxes and milk cans. Two of three caches of this archive were discovered after the war, in 1946 and 1950, with more than thirty thousand pages of material, but the archive remained relatively unknown for decades. It was housed in poor conditions in the Jewish Historical Institute of Warsaw, with thousands of documents that were not translated. In fall 2014, award-winning producer/director Roberta Grossman began filming a documentary about the Oyneg Shabes Archive, Who Will Write Our History? The film is based on a 2007 book of the same title by Samuel Kassow. The executive producer for the film is Nancy Spielberg. The filmmaker describes himself as “plagued with the inability to understand why a nation was so fixated on exterminating Jews and other minorities.” His work on this film represents his effort to understand the whys behind the Holocaust and other genocides. As such, the film is a unique contribution, as it focuses not so much on the historical events of the Holocaust but on providing a lens into understanding genocide. The film traces the history of anti-Semitism and its roots in Europe. Interviews with survivors of the Holocaust and programs, along with extensive archival materials, help viewers understand what life was like for European Jews before, during, and after the Second World War. The filmmaker’s hope is that the more people understand genocide and recognize the warning signs, the more likely we are to prevent such events or intervene in earlier stages in the future. Targum Shlishi’s funding helped to support the production of subtitles for the film in multiple languages, including Farsi, Spanish, German, and French. 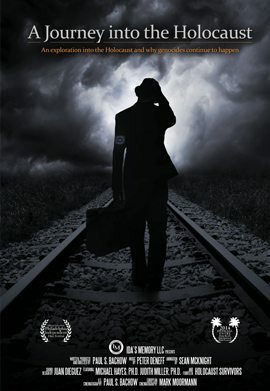 L’Chaim is a documentary film about the legacy of the Holocaust for the children of survivors. Targum Shlishi has helped support L’Chaim with modest grants for multiple years. Initially, Targum Shlishi took a chance on supporting the project early on, based on the vision and commitment of filmmaker Elkan Spiller, although there was no guarantee that the film would be completed or distributed. Spiller views the film as his life’s work, and spent years shooting footage, largely at his own expense. The film was released recently and while work is ongoing to have it screened at film festivals, schools, and universities around the world, the response has been extremely strong. The film has won five awards, has shown at multiple film festivals, has been screened in fifty-five cinemas in Germany and twenty-two in Holland, and negotiations are underway to screen the film on German television. A DVD (in five languages) is coming out and will be for sale. At the same time, the filmmaker has created curricular materials and has been presenting the film at schools in Europe. He is seeking distribution and screenings at film festivals, universities, and other venues, especially in the U.S., France, and Israel. The film is both a particular story about altruistic love that the child of survivors has for his parents and a larger commentary on ways in which the trauma of the Holocaust affects the next generation. Defending History is a robust website that publishes in-depth articles, opinion pieces, resources, booklets, maps, and more dedicated to defending the history of the Holocaust from deniers and those who attempt to distort it. Based in Vilnius, Lithuania, the English-language website is edited by Dovid Katz, with articles by many contributing authors. The articles, and the website as a whole, seek to oppose the European campaign of Holocaust revisionism; defend the integrity of victims; support Holocaust survivors and their families; advocate for the freedom to oppose governmental and other groups that want to rewrite history; defend human rights and equality; support the remaining Eastern European Jewish communities and Yiddish and Litvak culture; and defend historic Jewish cemeteries. Targum Shlishi is helping support Defending History’s efforts to monitor, document, and report on events that deal with the Holocaust, genocide, and commemoration of totalitarian regimes. Targum Shlishi is also supporting Defending History’s work monitoring international media on matters relevant to Holocaust revisionism.